OK well this isn't really a secret, but I think its something--based on some conversations I've had--that many people are surprised about. The secret is: in my experience, the majority of effort put forth at the farm this time of year is not planting or harvesting or irrigating, but its weeding. Weeding... that is, getting down on your hands and knees and pulling out unwanted plants one at a time by hand... hundreds / thousands of them... rows and rows worth of them... pulling the same row repeatedly. Growing organically means no spraying of anything to get rid of weeds. There are some weed barrier materials out there--landscape fabric, plastic weed "mulch" fabric, burlap, and paper products--but these are typically only used for one season then they are thrown away, which is a problem both for the environment and for a farmers wallet. I've used cardboard before when I had a smaller plot--1/4 acre--and it worked quite well. I had to purchase it, but at least its bio-degradable unlike plastic products. This year I'm going without weed barrier at all, instead just weeding by hand. The weather this spring /summer so far has been extremely conducive to plant growth, so the crops are growing well but so are the weeds. The field was plowed the first week of may and just three weeks later there were tiny little weeds popping up everywhere. So, you weed those and then just a couple weeks later , they're back. 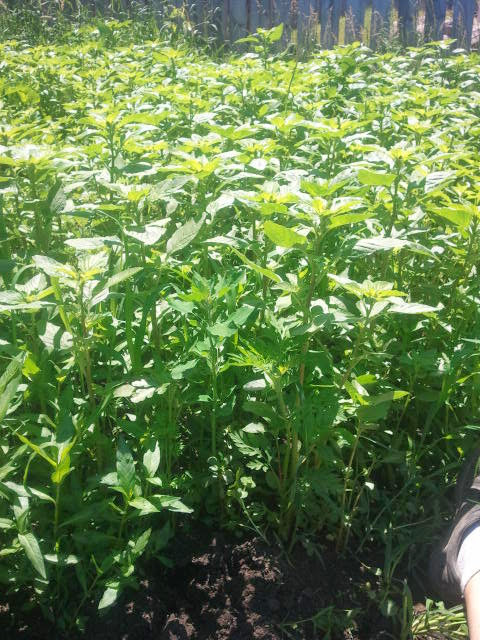 At this point we have mid-calf high weeds in about 1/3 of the planted rows. The only thing to do is to pull them out by hand. Here's what it looks like. A row of carrots and leeks before weeding this week.... you can't even see the crops under there. The row as we weeded it. On average, it takes two people about 30-45 minutes to hand weed 100 row feet. My acre farm has approximately 7,500 row feet. I"m not going to do the next math iteration because I don't want to depress myself! LOL. But my point is, when you wonder what organic farmers spend their days doing and you wonder why organic produce costs more than conventional produce, a lot of it is directly related to weeding. If I was a farmer using spray herbicide, I would have sprayed this field before I planted my seeds and most of this weed growth would have been stopped before it started. Instead, I have to hand weed every inch of the farm repeatedly throughout the spring and early some. I've come to find weeding to be very meditative and also rewarding. 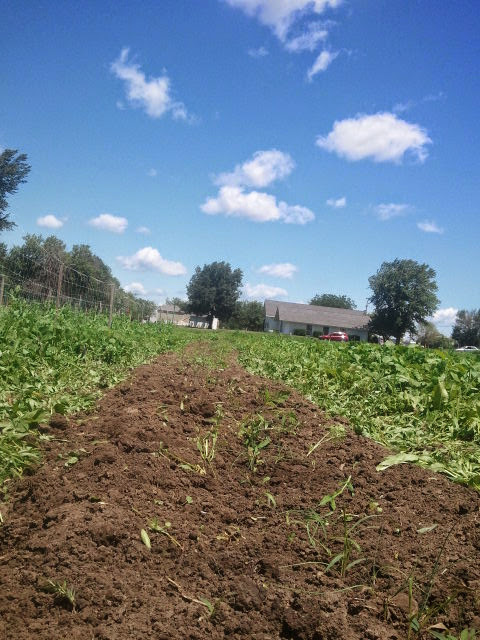 Starting with a totally weed infested row and ending with a neat and tidy row full of edibles feels good. Unfortunately I've also developed a mean case of "weeding elbow" or actually its more like "weeding wrist" wherein the repetitive motion of pulling the weeds have left me with chronic mild wrist pain. Farmers helper Nick still has elbow pain from pulling crab grass at the farm last year. Certainly, I am a farmer because I choose to do it and because I love it, despite all the reasons why any normal human being should hate it. So my intention here is not to complain, its just to give you a glimpse into what the day-to-day is like on the farm right about now. Thanks for reading! !